Another day planned, another day that went bums up and not to the plan. Ho hum. 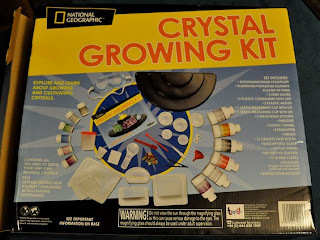 On the agenda today was reading, a trip to the park, chemistry set opening, blog and website work, and making crystals. What actually happened was a complete rearranging of the dining room, an overhaul of the home-ed resources, and a thorough on hands and knees clean up. The day started out very promising. I made a good start with the tidying up and daily cleaning whilst the children occupied themselves. Reading and workbooks seemed a very popular task today with history, geography, mathematics and french being covered by various small and not so small people. I was able to wash dishes, hoover and mop floors, put laundry in the machine, hang out now washed said laundry on the washing line (yay for nice weather!) and clean the bathroom whilst this "work" was going on. 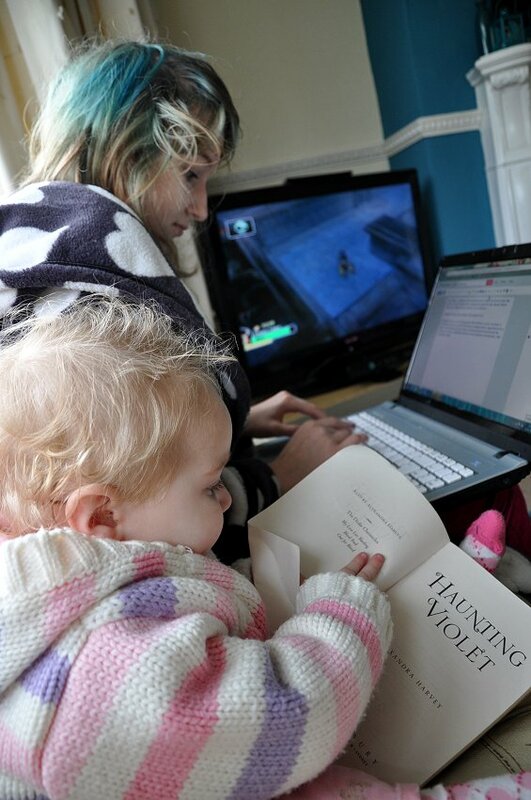 The very littlest person assisted me throughout. Chelsea started writing her blog again after a very long break away. She wants to try to blog at least every other day, which will hopefully encourage her to do something interesting at least every other day so she has something to write about! As you can see, that Haunting Violet book that Chelsea reviewed on her blog is very interesting, even to oh so little people. I was so pleased that I had achieved so much so early on in the day. 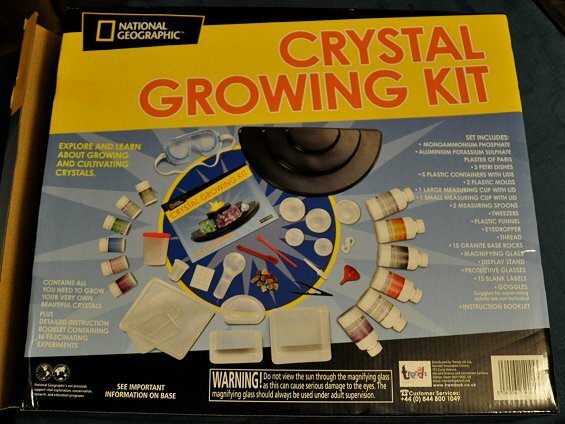 I had promised Tiegan that we would look at her Crystal kit that she got for Christmas together, so that was next on the list. I walked into the dining room (where we planned to do the kit) and was shocked at the total disarray. I knew I wouldn't be able to "work" in there so set about tidying. I should have taken photographs, at one point no one could get in or out of the room as there was so much mess on the floor. All home-ed resources were taken out of the filing cabinet and cupboards, and books were removed from shelves. It was one of those jobs that you wish you'd never started. It took hours. No actually it took hours and hours an hours. It took so long that husband returned home from work, hung around for an hour, and still no dinner had even been discussed let alone started. I ended up leaving the mess and nipping out for a takeaway. Once dinner was eaten, I set about trying to restore order again. It's almost done, just need to sort through Taisia's toy boxes. That can wait for another day. I was not going to back out of my promise, even if it was 9pm by this time and my body was yearning for rest. 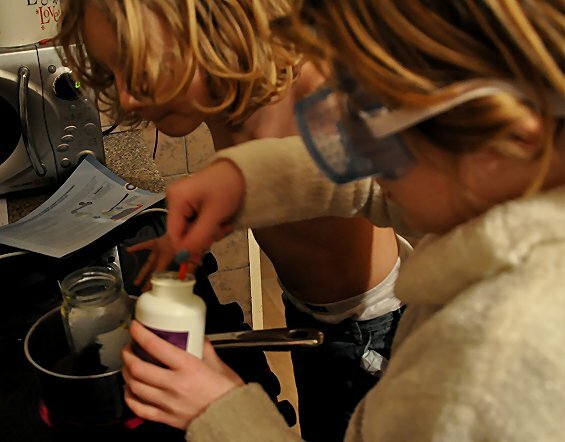 So, we had a late night science lesson mixing Aluminium Potassium Sulphate with coloured salt. Waiting for the salt to dissolve. 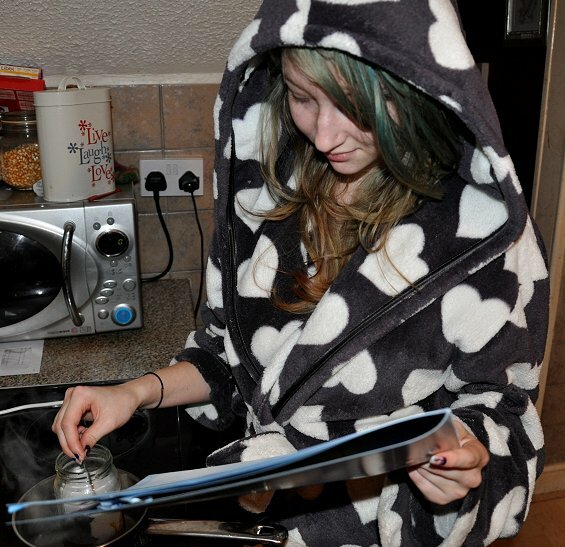 Yes, it's THAT dressing gown again! We have left it looking like a pure purple liquid in a lidded tub and will check if anything is happening in the morning. After this we went back into the lounge and the 3 children asked if they could read to me - at 10pm - what is going on? So Tiegan read two chapters of her Jacqueline Wilson "Best Friends" book, Callum read "The Gruffalo" (what else?!) and Chelsea read a chapter of some book I can't remember the name of. I shall find out and add the title tomorrow. Yep watched the programme admired both mums, but did find it a bit odd that mum carrying baby number fifteen was already talking about the next one! And a new pram with every baby good job her hubby is a patient soul... might be cheaper if she were a sling - a - holic!